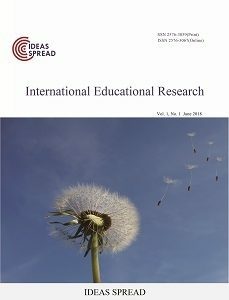 IDEAS SPREAD INC is an independent academic publisher, which is founded in 2017, dedicated to presenting and disseminating academic viewpoints of academics and researchers from around the world. We publish online version and printed version. In the near future, we will extend to other fields, including agriculture, biology, chemistry, environmental and technology. All of journals uses double-blind system for peer-review; both reviewers and authors’ identities remain anonymous. The paper will be peer-reviewed by three experts; two reviewers from outside and one editor from the journal typically involve in reviewing a submission. We invite experts from some of the top 500 universities in the world to serve as our peer reviewers. This will make sure that our assessment opinions are pertinent and helpful.